you could say we are slightly addicted to waffles and pancakes on the weekends. we are so well behaved during the week with our cereal for breakfast, so it's nice to have some fun on saturdays and sundays. 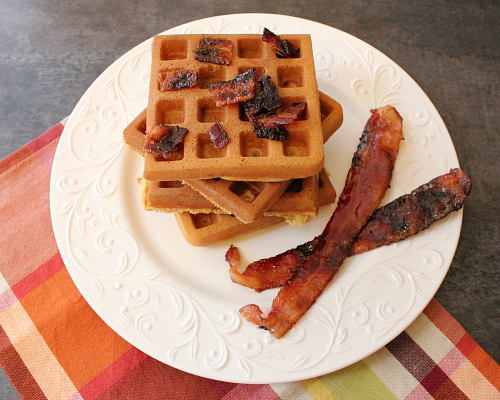 over the weekend we made waffles for breakfast with brown sugar bacon in them. 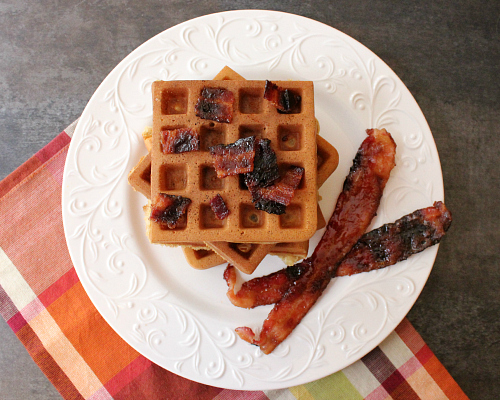 this wasn't our first rodeo with brown sugar bacon, but it was the first time we ever put it inside waffle batter. if you are a fan of bacon, you absolutely need to try brown sugar bacon. it is the easiest thing in the world to make and it is so incredibly good. all you do is arrange uncooked bacon on a baking sheet and sprinkle brown sugar over the top of it. the bacon gets really crispy in the oven and the brown sugar caramelizes on top of it. oh my goodness! 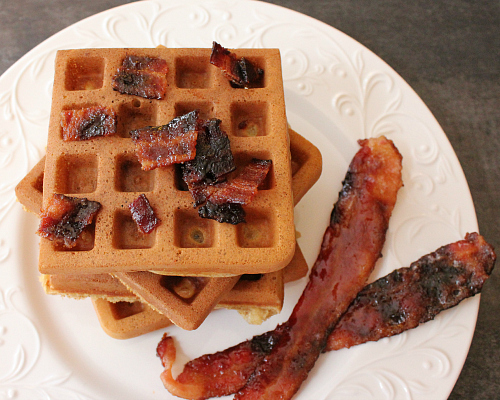 as if brown sugar bacon wasn't good enough by itself, it is even better inside waffles . . . with maple syrup. yum! now, if you are a fan of chicken and waffles, might i suggest trying these waffles with some poultry. we didn't have chicken prepared, but we did have turkey. (i roasted a 13 pound turkey over the weekend.) so, on sunday night, ryan warmed up one of the leftover waffles and covered it with some turkey and gravy. oh my goodness, it was so good. preheat your oven to 375 degrees F and preheat your waffle iron according to the manufacturer's instructions. 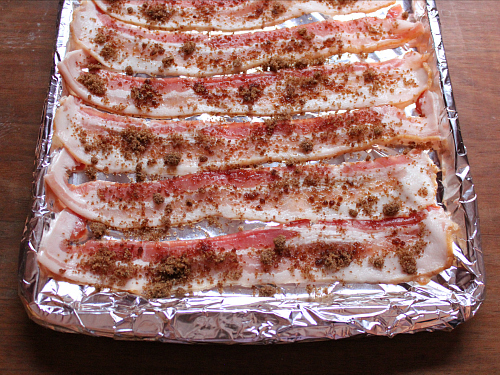 to make the bacon: cover a baking sheet with aluminum foil. arrange the bacon on the baking sheet in a single layer. generously sprinkle the brown sugar over the bacon. bake for 15-20 minutes, or until the bacon is crispy and the sugar has caramelized. remove from the oven. place the bacon on a cutting board (not a paper towel, they will stick) and allow the bacon to cool. once cooled, chop the bacon into small pieces. to make the waffles: in a bowl, combine all of the ingredients and whisk until incorporated. fold in the chopped brown sugar bacon. pour enough batter into the waffle iron to just barely cover the waffle grid (usually about 1/2 cup of batter per waffle). cook for 4-5 minutes, or until the waffles are golden brown. once cooked, transfer the waffles to a baking sheet and keep them in a warm oven while you prepare the remaining waffles. serve hot with maple syrup. Looks good. Some how when I see bacon I can also smell it. Making hungry. Oh this looks delicious! I must try it! Stopping by from the Family Fun Friday hop!